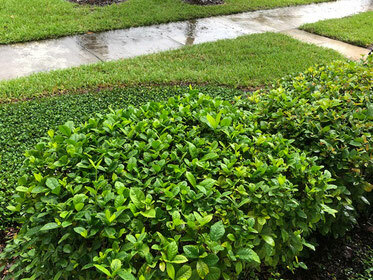 Summer in Florida means daily rain storms and green everywhere. Preparing for rainy season is important in Florida. A new layer of mulch can help choke out many of the weeds that would show up in or flower beds given the opportunity. During hot days, mulch can also keep the plants roots moist, keeping them alive. Some landscape may require supplemental watering. This may be plants under shade, or in areas with loose, sandy soil. It may be necessary to water certain zones, or to hand water areas of your landscape to keep your plants green and healthy. Trimming tree branches is also important before rainy season. Wet branches and leaves laying on a roof can prevent water from running off and cause premature wear of your roof system. Weak branches should also be trimmed before a windstorm blows them into nearby structures.